Latics could have done without this final international break of the campaign after hammering Bolton in their last outing. But they’ll pick up where they left off and improve one of the best home records with another important three points at the DW. Here’s where it starts getting a bit stickier. Latics have THE worst away record in the Championship, and have back-to-back trips to sides chasing a play-off berth. This clash at Ashton Gate will be tight, but the Robins pinched a last-gasp win over Latics here two seasons ago and a repeat could be in store. Next up is a midweek trip to Humberside to face a Tigers side who have been revitalised in the second half of the campaign under former Latics goalkeeper Nigel Adkins. This one won’t be pretty either, but Latics have the firepower on the counter to hurt Hull and have it in them to come away with a score draw. Here’s where ‘stickier’ becomes ‘super-glue’. Back-to-back games against two of the three sides fighting for automatic promotion in the space of five days. The Canaries will be backed by almost 5,000 away fans, which will create a great atmosphere in front of the watching Sky audience. But Latics will rise to the occasion and make their point. Latics will feel like lambs to the slaughter at a packed Elland Road, against a Leeds side desperate to restore top-flight football to their long-suffering fans. We know Marcelo Bielsa will have done his homework on Paul Cook’s men, leaving no stone unturned in their preparation, and this points to a home win. One of the biggest games of the campaign will be magnified by the huge stakes on offer, with both team battling to achieve their goals at their respective ends of the table. North End have been on an amazing run since hammering Latics 4-0 at Deepdale in October, but this one will be much closer. Score draw. 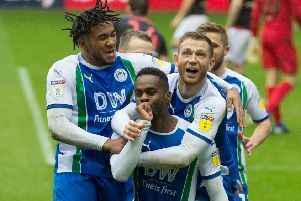 Birmingham enjoyed a comfortable win at the DW just before Christmas, but that was during Wigan’s winter of discontent and while Garry Monk’s side were flying. Now Latics are back to full strength, and Birmingham have plummeted into the relegation dogfight thanks to a nine-point deduction for breaching EFL rules, it’s all changed. Latics can take advantage of the tension inside St Andrew’s and record a first away win in eight months at the perfect moment. Much will depend on whether both sides need a result to stay in the division. If a point suits both - or the game is already a dead rubber - it could well be keep ball for 90 minutes. If Millwall need something to stay up, it could be a fight...and not just on the field. Let’s hope a point apiece suits all parties.